Garcia, H.; Koubychine, Y.A. ; Blair, G.; Aumeyr, T.; Schulte, D.; Shvedunov, V.
A precise measurement of the transverse beam size and beam emittances upstream of the final focus is essential for ensuring the full luminosity at future linear colliders. 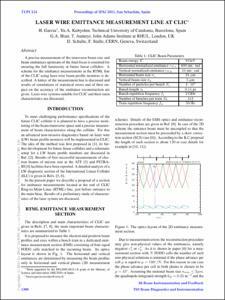 A scheme for the emittance measurements at the RTML line of the CLIC using laser-wire beam profile monitors is described. A lattice of the measurement line is discussed and results of simulations of statistical errors and of their impact on the accuracy of the emittance reconstruction are given. Laser wire systems suitable for CLIC and their main characteristics are discussed. Garcia, H. [et al.]. Laser wire emittance measurement line at CLIC. A: International Particle Accelerator Conference. "Proceedings of IPAC 2011". San Sebastian: 2012, p. 1308-1310.